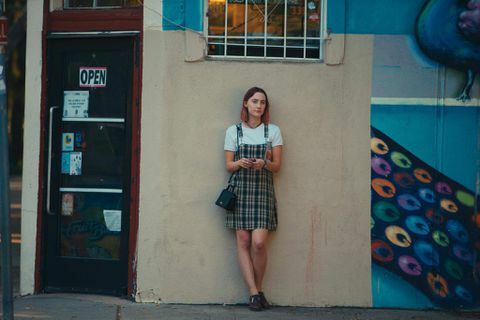 Saoirse Ronan in Lady Bird. The Sacramento seniors surrounding me chuckle knowingly at the epigram on the screen, offering immediate proof that the famous Sactowner knew exactly what she was talking about. I snuggle into my red plush Tower theatre chair with my small popcorn and soda water in this steeply raked theatre, gratified we've come to the perfect place to see Lady Bird, the best-picture Oscar nominee set here in Calfornia's capital city. The movie, like Sacramento itself, is good, complete and understated. Having heard the early buzz about the film, I decided to turn the date with my girlfriend to view the film into a pilgrimage of sorts. It would help me understand Lady Bird and, in turn, Lady Bird would help me understand Sacramento. When you're in San Francisco, Sacramento seems far away. When you're in Sacramento, San Francisco seems even farther. But we drive less than two hours to get here, listening to Diane Keaton read Didion's classic collection of essays Slouching Towards Bethlehem. We drive 11 blocks past the Sacramento River into the city proper and the Broadway District, arriving arrive just in time for lunch at Tower Café, founded on Earth Day in 1990. We were instantly transported. The café, living up to its full name of "International Restaurant and Bakery," is filled with global bric-a-brac: a yarn painting from Central America on the wall, a small statue of Buddha on the lush, landscaped patio. Yet they say their specialty is the very American French toast. It is super delish. After lunch, we walk 16 steps to the iconic Tower theatre and its beautiful Art Deco touches. The theatre appears in Ladybird and in real life it hosted the film's world premiere. I'll be surprised if Tower stops showing Ladybird after the usual Oscar extension. It could easily become The Rocky Horror Picture Show of this town. After the screening we drive five minutes to Gunther's Quality Ice Cream, which we saw briefly on the big screen. Gunther's will turn out to be my favourite thing in Sacramento. Established in 1940, it isn't retro, it just never went away. The cream is rich – 16-per-cent butterfat – and far superior to anything you've ever bought at a supermarket. We drive to the centre of town and the state capitol buildings, checking out what our taxes are doing. We park and stroll through the small rose garden. The flowers are named after towering figures such as Martin Luther King Jr., the Dalai Llama and … Betty Boop. The signage tells us the International World Peace Rose Garden was created to bring about world peace, and I think to myself that is the kind of peaceful ambition you can only find in a small town. As we hit magic hour, we get back in the car and drive west on M street from the capitol over the picturesque golden Tower Bridge, built in the 1930s. We cross the Sacramento River one more time, loop around a couple of blocks and go into the Crocker Art Museum. I'm not expecting this many floors, this much art, this kind of diversity or this fantastic a collection of California artists. I am delighted to be both wrong and surprised. On the drive home I try to summarize my feelings, and I think of the faux nostalgia becoming more prevalent in bigger cities: servers wearing plain aprons, and families checking out old-timey dessert parlours. In Sacramento it's not a recreation. It's the real thing.